Having a good name is terribly important in several ways, the first of which is what I call “inspirational quotient.” No matter how handsome, intelligent, or athletic a man is, it’s going to be difficult for him to overcome a name like Fester. The proof of this is that we give impossibly awesome names to our perceived heroic archetypes. It isn’t enough for a man to be powerful, principled, and noble, he also needs to have a last name for a first name, and a last name that’s a place where you can meet girls. If you don’t believe me, consider how cool the name Jackson Breckenridge is. Jackson Breckenridge is the kind of man who doesn’t have to choose between making love OR war, he fixes cars but has clean hands, and eats his steaks while YOU get the high cholesterol. If Jackson Breckenridge offends your less than chauvinistic sensibilities you can go the more sensitive route when naming your demigod by giving him a first name that’s an old timey occupation and a vaguely ethnic last name… like Cooper Johansen. Cooper Johansen plays banjo and upright bass, reads J.D. 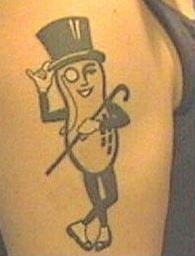 Salinger in French, and has a tattoo of Mr. Peanut just below his armpit. He watches Charlie Rose, writes children’s books, and even his black-framed glasses cry as he listens to the rainstorm. Of course giving someone a name like Cooper or Jackson means that you’ve also set some pretty high expectations for them in the minds of their potential fan bases, because a kid with a name like Austin Majors either grows up to be an astronaut or quarterback. Conversely, no one expects much of a Fester… other than slowly simmering in a pool of seething frustration and bitterness towards some remarkably clueless parents. When your name is Fester the pressure is off you and onto society, you get to say your name to someone’s face while simultaneously daring THEM to break eye contact. This is why I think it’s time for Tiger Woods to quit pretending that his first name isn’t really Eldrick. While Eldrick is the name inscribed on the birth certificate, “Tiger” is the name his family used to describe him. As he grew up in public, it came to define him. It was never meant to save him. While Tiger has spent the better part of his life managing the pressure that came from his nickname, he’s been crushed by it ever since he bounced his career down the cart path during Thanksgiving of 2009. Tiger Woods hasn’t come close to sniffing the phenomenal success he had before public revelations of his private relations brought the venom of an indignant audience to his doorstep. This isn’t to say that he hasn’t played well; he just hasn’t played like Tiger. There was a moment this past weekend when we saw glimpses of the Tiger as he stalked his way back into contention, only to disappear at crucial moments. If you’d heard that a PGA Tour pro named Eldrick Tont Woods, shot 10 under par and finished 4th at The Masters, you’d probably be pretty impressed… but you aren’t because Tiger doesn’t lose close matches, he thrusts his arms into green sport coats through the sheer force of his indomitable will. If he were just Eldrick the pressure would be off of him and on everybody else because people cut guys named Eldrick some slack. Which brings me to the second reason a good name is so important: good names go out ahead of us to secure the welcomed acceptance of others. Tiger has to drop the “Tiger” because as a name it isn’t any good anymore, it’s been ruined. “Tiger” is the guy who had it all and then lost it because he went about getting it the wrong way. “Tiger” no longer wins championships. Tiger has become a “Paper Tiger” and the name doesn’t inspire much welcome or confidence anymore. “Tiger” is the name we measure him by, but Eldrick could be a man resurrected beyond his former achievements. And that’s where this gets serious for each of us. Each of us has a name, and whether or not it inspires confidence in those around us, that name and it’s former glories, is tarnished by the misdeeds and transgressions of our past. While most of us will never know what it’s like to feel the false indignance of an uninjured, yet howling, group of “advocates” focused on our name; we have felt the withering gaze and disappointment of someone we actually have wounded. Where we go from this point of failure is a matter of humility that challenges even the bravest of Christians. We go back to the beginning of our spiritual journey, set our name back down and carry the name of Jesus as our true identity. For me it always goes wrong when I look to achieve greatness or dominance, making a name for myself in the process. I want to have it all and I’m willing to get it by going about it the wrong way. That’s when I look behind me and see the trail of the wounded in my wake. …but it takes walking away from the crushing weight of a failing name that was never meant to save me. Because Tiger Blood Is Hard To Resist. This is one of your best. I want to read it to Jack Donaghy. Thanks bro! Means a ton. Tripped on to this. Good stuff. I like the idea of avoiding the crushing weight of a name that wasn’t meant to save us. It realigns where we should put our expectations…right? Names conjure some sense of expectations. And when we fail to realize those expectations we maim those around us (regardless of intention). So what does it mean to take on the name of Jesus? A name that is wrought with the highest set of expectations? How do we live in the freedom He brings while embracing the responsibility that accompanies the branding we’ve received? Thanks for posting, Great line of though and questions bro, I know I chose Christianity because I wanted power and privilege as opposed to humility and courage. In Christ I found grace to carry his name in my feeble heart. I’m counting on that grace to deliver me from the weight of a name powerful enough to save me, even if I don’t deserve to carry it. How about you? Jon, Really enjoyed this post….Love the way you process. Reminds me of another friend who still carries his own name. A brilliant man but mired in this world. I pray for him every week. I hope some day to introduce you …I think you would both find each other fascinating…. Love that you’re standing in the gap for him man. Thanks for being such a killer part of all we do. I wonder what my life would be like if I was handsome, smart, & athletic . . .
All this time I thought your name was Lemmy… which was so heavy metal. On the serious side, you can’t go wrong with Bennett, it means to speak well of… Which is so apt and fitting. I Love bragging about you to people. Anyone who can sign their name with a III is cool in my books.